Bordeaux, FranceHe was descended of a good family in Kent. From his infancy he turned all his thoughts and affections to attain to the most perfect love of God, and studied to devote all his moments to this glorious pursuit. In this earnest desire, in the twelfth year of his age, he retired into a wilderness, and chose for his dwelling a great hollow oak tree; whence the surname of Stock wee given him. While he here mortified his flesh with fasting and other severities, he nourished his soul with spiritual dainties in continual prayer. His drink was only water; and he never touched any other food but herbs, roots and wild apples. While he led this course of life, he was invited by a divine revelation to embrace the rule of certain religious men who were coming from Palestine into England. Albert, the holy patriarch of Jerusalem, having given a written rule to the Carmelite friars about the year 1205, some brothers of this order were soon after brought over from mount Carmel by John lord Vescy and Richard lord Gray of Codnor, when they returned from the Holy Land. These noblemen some time after settled them, the latter in the wood of Aylesford, near Rochester in Kent, the former in the forest of Holme, near Alnewick in Northumberland; which houses continued the two most famous convents of this order in England till their dissolution in the thirty-third year of the reign of Henry VIII. But we are assured by Bale, who before his apostacy was himself a friar of the English province of this order, and by Lambert and Weaver in their accurate descriptions of the Antiquities of Kent, that the first or most ancient convent of these friars in England was that at Newenden in Kent, which was founded for them by Sir Thomas Archer or Fitz-Archer, whose family flourished for many centuries upon that manor. The first arrival of these friars in England is placed in the annals of the order, quoted by F. Cosmas de Villiers, in 1212. Simon, who had then lived a recluse twenty years, imitating the Macariuses and Arseniuses in the most heroic practices of penance and contemplation, was much affected with the devotion of these servants of God to the blessed Virgin, their edifying deportment, and their eremitical austere institute, and joined their holy company before the end of the year 1212. After his admission he was sent to Oxford to finish his studies; and having run through his academical course he returned to his convent, where so bright was the example of his piety, that the virtue of the rest seemed to suffer an eclipse by the extraordinary lustre of his sanctity. Such was his reputation, that in 1215 Brocard, prior of mount Carmel, and general of the order, appointed him vicar-general, with full power over all the western provinces. Many clamors being raised against this institute, St. Simon repaired to Rome in 1226, and obtained from pope Honorius III. a confirmation of the rule given to this order by Albertus; and another from Gregory IX. in 1229. Some years after, St. Simon paid a visit to his brethren on mount Carmel, and remained six years in Palestine, where, in 1237, he assisted at the general chapter of the order held by Alanus the fifth general. In this assembly it was decreed, that the greatest part of the brethren should pass into Europe, their settlements in the east being continually disturbed by the persecutions, oppressions, or threats of the Saracens. In 1240 many were sent to England, and in 1244, Alanus himself, with St. Simon, having nominated Hilarion his vicar on mount Carmel, and in Palestine, followed them thither, there being already five monasteries of the order erected in this island. In a general chapter held at Aylesford in 1245, Alanus resigning his dignity, St. Simon was chosen the sixth general, and in the same year procured a new confirmation of the rule by pope Innocent IV., who at the saint's request received this order under the special protection of the Holy See, in 1251. St. Simon established houses in most parts of Europe; but this institute flourished nowhere with so great splendor and edification as in England, and continued so to do for several ages, as the annals of the order take notice. 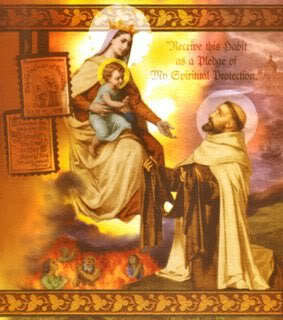 St. Simon, soon after he was promoted to the dignity of general, instituted the confraternity of the Scapular, to unite the devout clients of the Blessed Virgin in certain regular exercises of religion and piety. Several Carmelite writers assure us that he was admonished by the Mother of God in a vision, with which he was favored on the 16th of July, to establish this devotion." This confraternity has been approved, and favored with many privileges by several popes. The rules prescribe, without any obligation or precept, that the members wear a little scapular, at least secretly, as the symbol of the order, and that they recite every day the office of our Lady, or the office of the church; or, if they cannot read, seven times the Pater, Ave, and Gloria Patri, in lieu of the seven canonical hours; and lastly, that they abstain from flesh-meat on Wednesdays, Fridays, and Saturdays; or if this cannot be done, that they double for each of these days the seven Paters, &c. St. Simon cured several sick persons by giving them the scapular; the reputation of which miracles moved Edward I., king of England, St. Louis of France, and many others, to enrol their names in this confraternity.